During his appearance on Who Do You Think You Are? 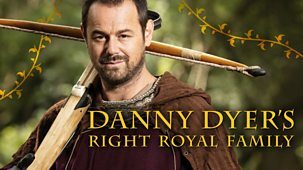 Danny Dyer discovered he was descended from King Edward III, but in this two-part series Danny uncovers a bigger family tree with even more royal and aristocratic ancestors. Now Danny delves into the lives of his royal and noble forebears to find out how they lived, as he immerses himself in their pursuits, passions and lifestyles. From the Vikings to the Tudors, Danny dresses, eats and lives his way through his family tree. And, remarkably, his journey is a retelling of 800 years of British history, which is all there in his bloodline.\n\nIn this episode, Danny's first stop is Edward II and his French wife Isabella whose lives, to Danny's delight, play out like a medieval soap opera. As Danny romps through his family tree he dons 14th-century armour and learns to fight like his 19-times-great-grandfather, famous medieval knight Henry Hotspur Percy. 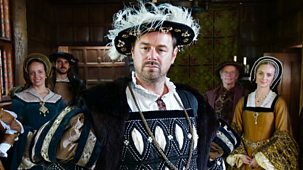 To get closer to his Tudor ancestors Danny brushes up on his etiquette by learning to sing and dance just like one of Henry VIII's courtiers. And finally, Danny gets his hands on a ruff when his own family, in all their Tudor finery, join him at an Elizabethan sugar banquet.